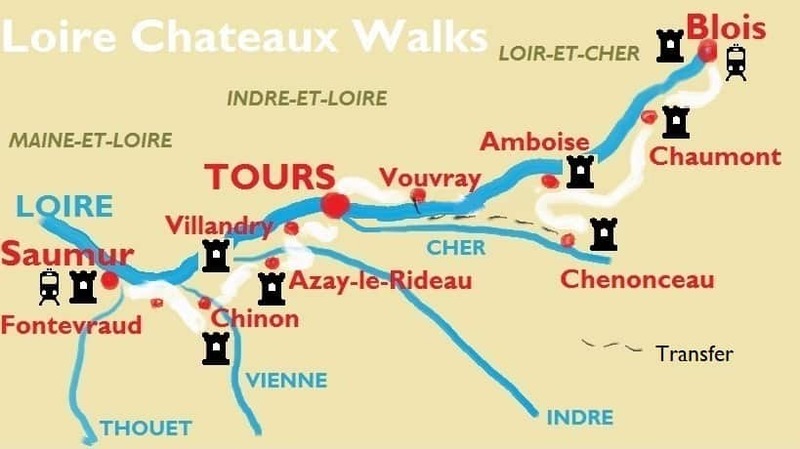 Loire Chateaux Walks is an seven or ten-night Loire heritage walking tour featuring the best of The Loire’s castles, troglodyte dwellings, vineyards, wines plus Fontevraud Abbey. Concise details on the tour can be obtained by downloading the 7-night tour pdf [left] or the 10-nighter [right]. Alternatively, read the tour description below and click through the sub-headings in the right-hand column for information on how to get to the start of the tour, accommodation, what’s included and prices. New – please check out the independent customer reviews for the tour at the foot of the page! oire Chateaux Walks is the perfect mix of light walking and cultural immersion in UNESCO’s world heritage central Loire Valley. You will enjoy seven or ten days of gentle walking, along a varied mix of trails, that facilitates your experiencing at first hand the many splendours of life along the most-blessed section of France’s longest river. Loire Chateaux Walks starts in Blois [10-night version], capital of the department of Loir-et-Cher, where Joan of Arc once resided. It boasts a fine Renaissance Chateau, which was home to King Louis XII. Eleven days later you bid au revoir to La Loire in splendid Saumur, 100 miles to the west in Maine-et-Loire, with its imposing medieval castle or ‘chateau fort’ originally constructed in the 10th century by Theobald I, Count of Blois. Alternatively, the eight-night tour starts in Amboise, also home to its own fine Renaissance Chateau. In between, you have the opportunity to… visit numerous chateaux [Renaissance and Medieval – see map below] as well as Europe’s largest monastic complex, burial place of none other than Richard the Lion Heart; appreciate the visual splendour of Villandry’s renowned and unique 16th century gardens; feast on some of the region’s distinctive troglodyte dwellings carved out of the local ‘Tuffeau’ limestone – and even sleep in one for the night if the idea appeals; gain the acquaintance of several other tributaries of La Loire and spend a half-day exploring its largest city, Tours, where the French pronunciation is considered neutral and the wine superlative. So the objective of this walking tour is two-fold: half-day walks that ensure you have sufficient time to visit the castles and other manifestations of cultural heritage, rather than enjoy full day walks plus rushed visits in the late afternoon or the following morning. These castles are state managed so, in the land of the 35-hour-week, don’t expect them to be open before 9am or after 6.30 pm! In a sense, then, the walking is in many ways functional – a prelude to get you into position for the day’s main activity and, to that effect, we include some short morning transfers to help you on your way. As usual, The Enlightened Traveller brings you the very best of accommodation to complement the trip every step of the way. On this occasion, choose between superior hotel-led stay [including six excellent dinners], or carefully-selected and characterful chambres d’hotes du charme on a B&B basis. Dinner options abound: just select from the local options available. Finally, as qualified students of French wine, it is difficult for us to describe our Loire Chateaux Walks tour without referencing some of France’s finest wines: you will be able to appreciate the best of the wines from the AOCs of Touraine and Saumur – Chinon, Cheverny, Vouvray and the Rosés de Loire that are so distinctive from the rather bland and over-acidic Loire offerings that find their way onto the shelves of the world’s supermarkets and wine stores. And whilst responsible walking means wine drinking is not to be encouraged during the day, our tour dossier provides you with ample insight on the region’s appellations that will enable you to make an informed choice at dinner as to what will best complement your evening meals. Furthermore, where chateaux are absent, such as in Tours, opportunities to improve your oenological profile are normally available. All such details are to be found in the comprehensive tour dossier. Loire Chateaux Walks facilitates your experiencing the unique heritage of the Loire Valley as very few others get to enjoy it – in other words, without the hindrance of driving or cycling. So forget the inflated car parking fees and queues, or the concerns over bike theft and punctures, and take complete control of your Loire Chateaux experience. You know it makes sense and are sure to become our informal ambassadors for years to come. 10 nights B & B and all hotel taxes. Luggage transfers and five morning transfers. 1:50,000 scale maps – perfectly adequate for orientation in this low-relief region. A comprehensive and themed vacation dossier featuring the chateaux and wines of La Loire. Emergency telephone help-line service with native-English speaking backup from 8am to 8pm. As above, but without dinners. Entrance fees into Chateaux, Abbeys, etc. Note: This is a very popular tourist area, attracting visitors from all over the world and throughout the season. Early booking is thus advised. Our commitment is to bring you your preferred accommodation option, guest house-led or Hotel-led, in its purest form. However, we cannot guarantee that corresponding accommodation will always be available at each stage and so this cannot be a precondition of your booking. 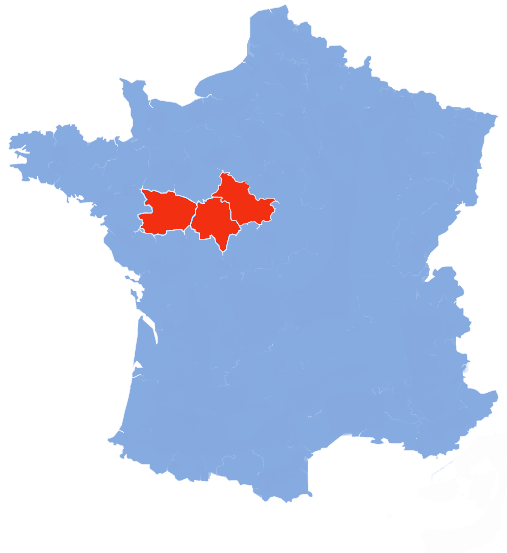 Where we are unable to accommodate you in the desired chambres d’hotes or hotel stay on a particular night, you will be placed in an equivalent hotel or guest house, respectively, with a corresponding adjustment (increase or decrease) in fees. For example, if our chambres d’hotes du charme in Fontevraud is fully booked on your available date(s), an upgrade to the local 3-star hotel is required at a supplement of 40 euros per person. No suitable guest hose exists in Villandry, so hotel accommodation there is already priced in. 7 nights B & B and all hotel taxes. Luggage transfers and three morning transfers. Immerse yourself in UNESCO’s Garden of France and one of the Country’s top wine-growing regions, showcasing arguably the very best of French dry rosé wines. average 10 miles/16 kms per day. Choose from superior hotel-led or chambres d’hotes du charme-led tours – see note below for further details. Superior hotel-led tour includes six diners for your convenience. The Chambres d’hotes du Charme do not offer evening meals. Restaurants are plentiful and listed in the tour dossier – the two places where they are not, we book you a table in advance. Conveniently-located and varied restaurants to suit different budgets and tastes – information provided in tour dossier. Note: This is a very popular tourist area, attracting visitors from all over the world and throughout the season. Early booking is thus advised. Our commitment is to bring you your preferred accommodation option, guest house-led or Hotel-led, in its purest form. However, we cannot guarantee that corresponding accommodation will always be available at each stage and so this cannot be a precondition of your booking. Where we are unable to accommodate you in the desired chambres d’hotes or hotel stay on a particular night, you will be placed in an equivalent hotel or guest house, respectively, with a corresponding adjustment (increase or decrease) in fees. For example, if our chambres d’hotes du charme in Fontevraud is fully booked on your available date(s), an upgrade to the local 3-star hotel is required at a supplement of 40 euros per person. Blois or Amboise SNCF station is 1½ to 2 hrs journey from Paris and 5 hrs from Lyon – see https://loco2.com/ for details. Saumur SNCF station is approx. 2½ hrs from Paris and 5 hrs from Lyon. You walk through The Garden of France on a mix of trails, alongside river banks, through woods and forests, across farmland and alongside vines, with very modest elevation gains or losses. Day 1: Arrival in Blois by train [10-night trip only] and hotel check in. Early arrival recommended so as to maximize time in the Chateau Royal and enjoy a walk around the adjacent gardens – followed by a saunter around town and your first look at The Loire river. Night in Blois. You are collected from your hotel and transferred a short distance out of town for your first hike along The GR3 as it wends its way along the left bank of the Loire to Chaumont via the Beuvron tributary – not to mention your first experience of Loire Valley wood-walking. [10½ miles-17 kms, 4½ hrs]. A short transfer out of town and we climb to the giddy heights of 112 ms and enter the department of Indre-et-Loire before descending to l’Amasse, a small Loire tributary at Souvigny. Then its a mix of copse, wood and lost hamlets before arrival in Amboise. As well as the Chateau Royal and the Chapelle St Hubert, you can visit Le Clos Lucé – home of Leonardo da Vinci. Our 7-night trip commences in Amboise. Early arrival recommended so as to maximize time in the Chateau Royal and enjoy your first look at The Loire river. A charming, bucolic hike through the Amboise forest en route to arguably the quaintest chateau and gardens of the whole week – with access secured via walking a series of the symmetrical allées, so common in these walking-oriented parts. You are transferred from Chenonceau to Vouvray after breakfast. A picturesque morning’s walk is followed by a memorable tour of…Tours, capital of La Touraine and important staging post along the Paris-to-Compostella pilgrimage route. There’s plenty to see [old quarter, cathedral, basilica, Musée de Beaux Arts] and we’ll even recommend the best place for lunch. Then see the rest of the highlights before retiring to your comfortable hotel, conveniently-placed for dinner and your onward journey tomorrow. Our 7-night trip omits an over-night stay in Tours. Instead, you are transferred from Chenonceau to Tours after breakfast. You can spend two or three hours in the historic centre before continuing onto Villandry as per Day 6. You walk beside the Petit Cher and the Cher on route to Savonnieres, where the traditional flat-bottomed river boats abound. Then climb the 100 steps [we make it 110] to a fine ridge and passageway to the ancient village of Villandry, with its magnificent castle and ornate 16th century gardens. [8½ miles-13½ kms, approx. 3½ hrs walking]. An easy-going half day’s walk through the Vallee du Vau on route to the quaint village of Azay with its Renaissance chateau lapped by the waters of the river Inde. [7½ miles-12 kms, approx. 3 hrs walking]. A short transfer after breakfast gets you to the start of the Route forestiere de Rabelais followed by the Allee Louis XI. The ledge walk from the outskirts of Chinon is worth savouring, which drops you conveniently at the front gates of Chinon’s magnificent medieval castle overlooking La Vienne river. This bijou village is also blessed with its fine red wine. Hug the river Vienne for the first half of the trail to La Chaussee. Then kick out across the Vallee des Veaux and through the Fontevraud forest. Enter Maine-et-Loire, pass the Chapelle de Notre Dame de Pitie before arriving in sacré Fontevraud, resting place of two Plantagenet kings and queens of England, including Richard The Lionheart. Both Abbey and hotel are a treat. A short transfer after breakfast takes you to the confluence of the Loire and Vienne rivers. You can visit the Chateau de Montsoreau [made famous by Alexandre Dumas] and a troglodyte wine estate before striding out across AOC Saumur-Champigny country. Plenty of fine belvederes await along the balcony route to Saumur, with its ‘chateau d’amour’ perched on a tuffeau slope. Note: option to split this last day in two so you can have more time to visit both Montsoreau and Saumur chateaux – please ask for details. Day 11: Departure day – end of your Loire Chateaux Walks tour – Saumur has a gare SNCF, so onward travel by train is very convenient. Personalise your tour length and accommodation type to suite your preferences. The best times to walk the trail are April to June & September and October. "A multi-faceted journey along France's favourite river with options to tailor-make the experience in advance as well as en route."